Learn to teach art from some of the best art teachers. The Bachelor of Fine Arts with K-12 Art Teacher Preparation is for students interested in teaching art at the K-12 level. Built upon the BFA Degree, this is an intensive program of study aimed at developing a foundation of attitudes, traits, and abilities with which to begin a lifetime as an artist and teacher. Emphasis is placed on students' personal experiences as the source of artistic motivation. The broadly based liberal studies curriculum provides students with a diversified background which, in concert with their professional training, should lead to a successful career in art and education. The BFA, plus six additional certification-related courses taken concurrently, can be completed in eight semesters. Graduates will have one semester of student teaching, and will obtain certification, through Carlow University. Why Choose Art BFA With Teacher PREPARATION? This is an intensive program of study for artists interested in developing the attitudes, traits, and abilities with which to begin a lifetime vocation as an artist and teacher. This program focuses on a candidate's personal experience as the source of artistic motivation. The broadly based liberal studies curriculum, in concert with professional training in the visual arts and in education, should lead to a successful career as an artist who shares their passion for art with others. Students from diverse backgrounds will be immersed in an art program to enhance and develop their artistic abilities while obtaining a solid foundation in education. Coursework will include study in each studio area, with focus and professional development in at least one artistic discipline. This Concentration includes all coursework and requirements specified by Pennsylvania Department of Education, with student teaching and K-12 Art Teacher Certification obtained through Carlow University. After student teaching and obtaining K-12 Art Teacher Certification through Carlow University, the career path for graduates with this concentration will be to pursue K-12 art teacher positions. 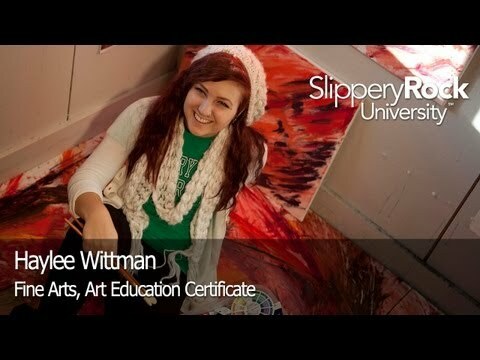 Haylee Wittman is an Art major at Slippery Rock University. She loves her major and the different courses she is able to take. Haylee is involved in numerous organizations around campus such as: Tom's club, Poetry club, and First Year Leader Scholar Program. She has had the opportunity to participate in an SRU Carebreak trip to Washington D.C, which has opened her eyes to many future careers dealing with art. Bachelor of Fine Arts: The Bachelor of Fine Arts degree program is for students interested in art as a profession. It is an intensive program of study aimed at developing a foundation of attitudes, traits, and abilities with which to begin a lifetime as an artist. Minor in Art History: The 18-credit minor in Art History will provide the student with an introduction to the art of the Western and Non-Western world. In addition to the two introductory courses (ART225 and ART226), the student will have a choice of four courses. Bachelor of Art: A broad visual art program provides a concept driven & diversified exploration suitable to all manners of creative disciplines and an excellent foundation for further study.